A quick reminder not to dare God, after a popular South African pastor dies following 30 days fasting in a bid to break Jesus Christ’s record. In a determined bid to break the record set by Jesus Christ of Nazareth, a 44-year-old popular South African pastor, Alfred Ndlovu, has died of malnutrition following a dry fasting that lasted for 30 days. According to Buzz South Africa, the cleric left home on June 17 for a nearby bush to have prayers just like Jesus did in an attempt to equal or break Jesus Christ’s record of fasting for 40 days, but died just a month despite having no history of illness. 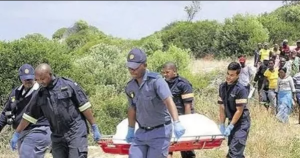 It was learnt that the pastor was alone in the wilderness and his body was found by a stranger who then called on his family, congragation and the police. He was known by his family and community at large as a very spiritual person whose faith could move mountains and his death surprised everyone, even church members.